My name is Linda and I am 37 years old. 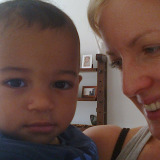 I have been working as nanny for expat families living in Budapest for the last 6 years. I am very patient, caring and reliable. I am working for 2 families now as a nanny so I can provide references if it is required. I am available for evening babysitting during the week (Mon-Fri) every day from 5pm-12pm so I can help you if you have late business meetings or just would like to go out. I can help with easy housework if it is required. I can look after children age above 2 years, and maximum 3 children at a time.